Abbey Heat Transfer can repair or manufacture the following from your pattern or specification/drawings. We have now added a third larger ultrasonic cleaning tank to complement our existing two tanks, to further increase our capacity. 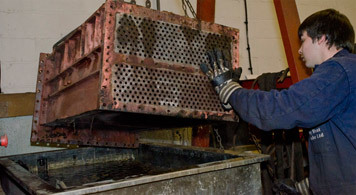 Our ultrasonic cleaning department specialise in the overhaul of charge air coolers and intercoolers where we offer the option of cleaning only, or of a complete strip, clean, rebuild and test using new gaskets and new nuts / bolts etc. where necessary ready for re-fitting back onto engine.